Above are two rare photos depicting our great grandparents, James Drew and his wife, Theresa Cusick. Her name is often written "Cusack" also. James was born in Lakenstown, [near Mullingar] County Westmeath, Ireland, son of Irish peasants, John Drew and Rose Reilly Drew. His father, and probably his uncles and forebearers were known as very good stonemasons. No middle name appears on any of the documents that we have collected; but his grand-daughter, Camilla Gallagher, reported that his middle initial was "C" and was not aware of what the "C" stood for. Theresa was born in New York, the daughter of Irish immigrants. It is believed that her family later moved to Philadelphia and then to Kentucky or Indiana where she met and married James in December of 1861. Fully researched websites are on line and contain much information regarding the history of the Drew family and their origins in Ireland, and James' family of origin. James Father brought at least 5 children from Ireland to the U.S.A. in 1847. To review these websites, use the following URL's. James and Theresa had a total of at least eight children... only 4 of whom survived. Theresa was born in 1843. Her place of birth is consistently listed in the Census reports and other records as "New York." [NOT necessarily New York City.] 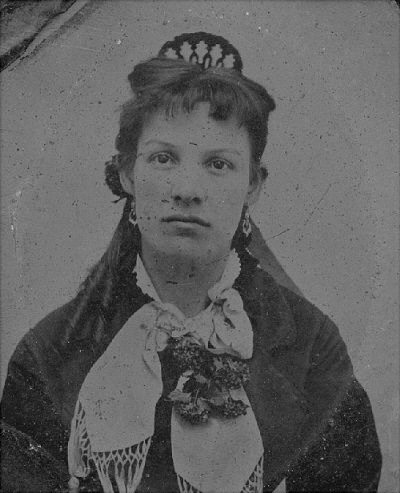 We know that she was the daughter of Irish immigrants; but, by 1860 she must have been living in Daviess County, Indiana, where she met James Drew (age 26) when she was about 16. There is nothing but scanty "tradition" to inform us about Theresa's parents. I remember hearing her grandsons (the sons of "Harry" Drew) discussing her origins. The grandsons were in agreement that Theresa's father worked for the fire department; but they disagreed as to whether it was the Baltimore or the Philadelphia Fire Department. One "clue" would be that in the year of her marriage to James Drew, James's brother, John, left Indiana and joined a New York Regiment [NY 71st Infantry] preparing to fight in the Civil War. Even though John Deserted (July 4, 1861) this story might hold a "clue" in that it suggests that the Drew and Cusack families might have had ties that went back to Ireland and that John's presence in New York was connected with the Cusack family. [The idea that the families were related, however, seems ruled out since Theresa and James married, and the Catholic clergy of those times was very strict regarding the consanguinity rules.] Beyond this, I am not aware of any additional information or clues... and... THIS RESEARCH IS STALLED! Upon their arrival in the U.S.A. in 1847, James and his family spent about 10 or 11 years in Kentucky. Records are scarce but seem to confirm the tradition that they settled in the Lexington area... and there is also a tradition and some evidence that they may have lived for a time in Louisville. Research is ongoing on this matter. Probably about 1858 or thereafter, James moved to Daviess county, Indiana. 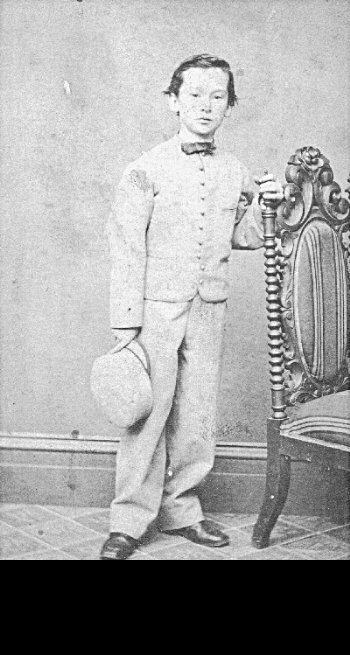 He was definitely there in 1860 and in May of that year, shortly after the death of their father, John Drew, Sr., James filed for and received legal guardianship of his younger brother John Jr. aged 17 at that time. No document has been found; though we know that the family bible lists the date of the marriage as December __, 1861, just a few months following the purchase of the farm. Their first born, Catherine, was born almost exactly a year later. THE 1870'S: MORE CHILDREN & "TROUBLE ON THE FARM"
With the birth of Rose ["Rosie Jane"] in 1872, the family consisted of 5 children. As far as we know, all of them were healthy and thriving as the photos below seem to confirm. In 1878, Rosie would have begun school, and her eldest sister would have attained the age of 16. With all 5 children now schooling, Theresa would have attained the age of 35; and James, 45. There had been no more children born for 6 years. All the photos below seem to have been taken within the time span 1878-1881 and serve as a nice visual "snapshot of the family"
The photo at lower right however, my grandfather at age 1, serves as confirmation that Theresa and James's family was not complete yet. In fact, still another son, William Leo, (Named for the sitting Pope?) was born in 1885; but lived only a few months. Click on the photo to see it full size The photo above is believed to beCatherine Drew, the eldest child of this family at about age 16. 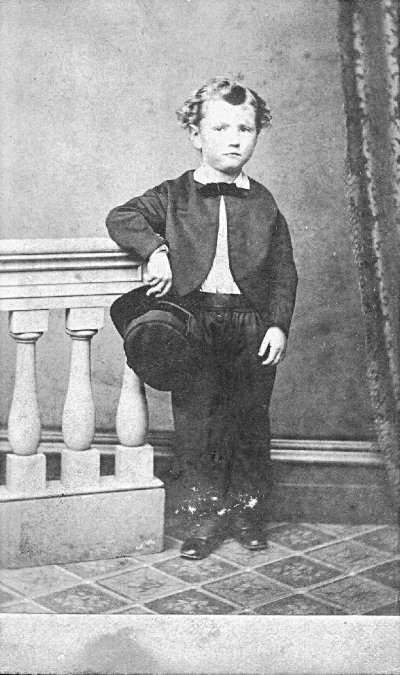 The photo is an old "tin type"
Click on the photo to see it full size We believe this to be a photo of John E. Drew (1866-1892) who was the second born (after Catherine) and eldest son of James Drew and Theresa Cusack. We believe this to be a photo of George B. Drew, (b.1870) who is mentioned in James Drew's will as inheriting a horse "provided he will stay at home and care for his mother." The picture would be from about 1878. Click on the photo to see it full size We are certain that this a picture of our grandfather, James H. ("Harry") Drew (1880-1937.) 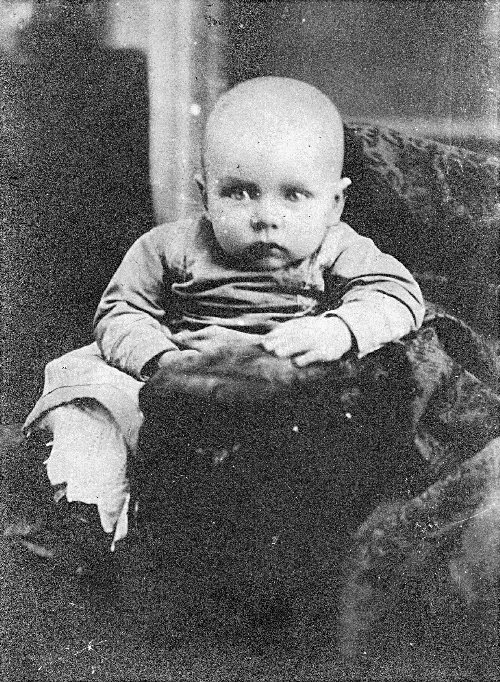 Although James and Theresa (Cusick) Drew had one more child (William) in 1882, William died in infancy; so our granfather was the youngest surviving child or "baby" of the family. William Leo Drew, b. June 20, 1885 ~~ d. October 10, 1885. NOTE: This family kept a bible with birth, marriage and death records. My uncle Bill wrote down and sent me all the entries from that bible in 1969 and I have used them for the following summary. I believe Bill said the bible was in the custody of his brother, Richard F. Drew. To anticipate and clarify some possible confusion, the Irish "nickname" for Mary is "Molly." Even though James and Theresa named the child born May 20, 1864 "Mary," this child died the same day it was born. The child born 4 year later, on August 18, 1868, was also named "Mary" and was referred to as "Mollie" in most documents.